TOKYO -- A powerful and extremely deep earthquake struck near a group of remote Japanese islands and shook Tokyo on Saturday, but officials said there was no danger of a tsunami, and no injuries or damage were immediately reported. 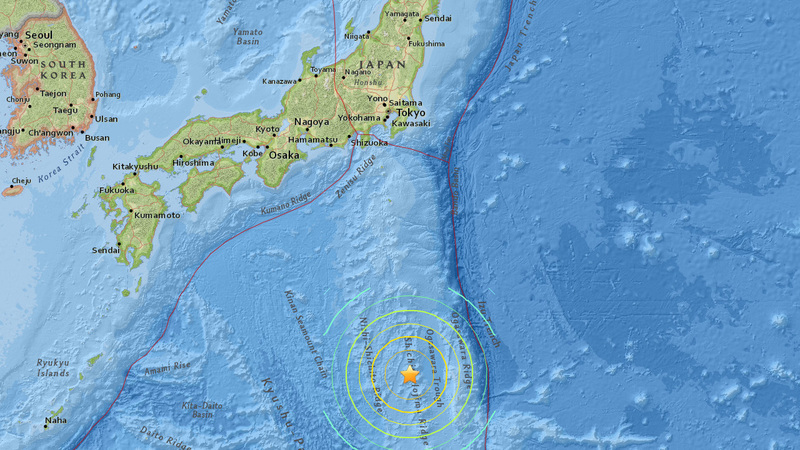 The offshore earthquake struck off the Ogasawara islands at 8:24 p.m. at a depth of 590 kilometers (370 miles), Japan's Meteorological Agency said. The U.S. Geological Survey said the quake had a magnitude of 7.8 and a depth of 678 kilometers (421 miles). Public broadcaster NHK said there were no immediate reports of injuries or damage. But the temblor was powerful enough to rattle large parts of Japan's main island of Honshu. Buildings swayed in Tokyo - about 1,000 kilometers (620 miles) north of the islands - and stopped some train services in the city. There reports that parts of the capital were without power. The meteorological agency did not issue a tsunami warning because the quake struck so far beneath the earth's surface. Deep earthquakes usually cause less damage at the surface than shallow ones.